Tomato paste is made from fresh tomatoes that have been cooked for several hours and then strained. The strained tomatoes are then cooked longer to reduce them to a thick concentrate. 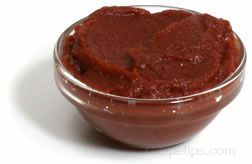 Tomato paste is used to thicken, add flavor and to add color to sauces or foods. Commercial tomato paste is available in cans or tubes from most grocery stores however, caution should be used when adding this to a food because adding too much may overpower the flavor or cause the taste to become too acidic. After opening tomato paste, it can be kept refrigerated for several days if it was canned, while tube paste will last for approximately a month. The difference between tomato paste, tomato puree and tomato sauce is texture and depth of flavor. The thicker the consistency, the deeper the flavor will be. 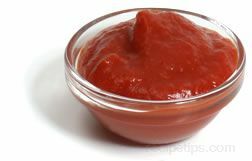 Tomato paste is the thickest; then puree is next in consistency, and tomato sauce is the thinnest. Tomato puree is made from tomatoes that have been cooked for a short amount of time and then strained, producing a thick sauce which is used to add flavor, color, and body to a sauce. Fresh tomatoes can be pureed by peeling and removing the seeds and then pureeing the peeled tomatoes in a food processor and then adding salt and citric acid. Commercial tomato puree is available in cans or tubes from most grocery stores however, caution should be used when adding this to a food, because adding too much may overpower the flavor or cause the taste to become too acidic. After opening tomato puree, it can be kept refrigerated for several days if it was canned, while tube puree will last for approximately a month. The difference between tomato paste, tomato puree and tomato sauce is texture and depth of flavor. The thicker the consistency, the deeper the flavor will be. 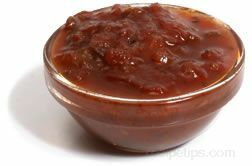 Tomato paste is the thickest in consistency; then puree is next in consistency, and tomato sauce is the thinnest. A tomato product that is not as thick as tomato puree but thicker than tomato juice. It generally has its flavor enhanced by the addition of herbs, spices, onion and garlic. Tomato sauce is commercially canned and sold in most food stores. 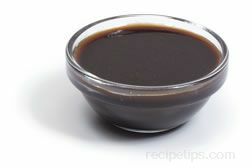 It is used as a base for other sauces and in a variety of dishes. The difference between tomato paste, tomato puree and tomato sauce is texture and depth of flavor. The thicker the consistency, the deeper the flavor. 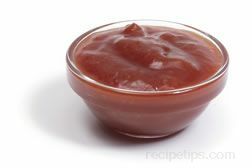 Tomato paste is the thickest in consistency, puree is thinner than paste, and tomato sauce is the thinnest. 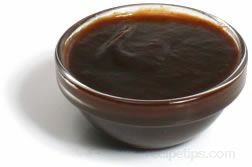 Barbecue sauce is a savory sauce used to complement barbecued or grilled foods. 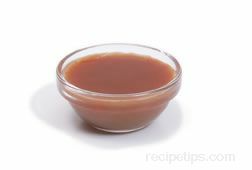 The sauce can be described as tangy, spicy, and/or sweet and can be prepared in an infinite number of ways. The basic types of barbecue sauces are classified as follows: red, or tomato based, mustard based, vinegar based, and white, which often uses mayonnaise or lighter colored ingredients as the base. 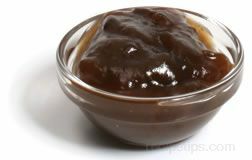 A type of barbecue sauce that is lighter colored instead of darker varieties such as the red or brown sauces that are more common. 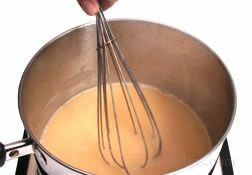 Ingredients used in the white barbecue sauces typically have a light ivory to tan colored appearance such as soybean oils, light vinegar, eggs, and seasonings. 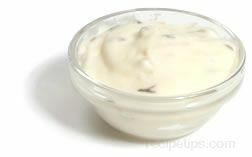 Mayonnaise is a typical base for the white sauces made in areas around northern Alabama. 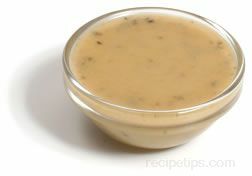 Often used with grilled chicken, turkey, pork, or vegetables, the lighter or white barbecue sauces may also be used as a food marinade or as a dipping sauce. A spicy sauce used as a condiment or for flavoring various recipes. It is usually made with chilies, vinegar, and salt. A hot sauce made with red hot peppers, vinegar, salt, and special spices. Many of the Louisiana hot sauces are made with cayenne peppers, which provide for a mild hot sauce. Tabasco sauce is a well known Louisiana hot sauce that is made with Tabasco peppers. Louisiana hot sauce is used to add a unique spicy flavor to many foods, such as meat, seafood, eggs, soups, gumbos, and soups. It is also used as a condiment and is the ingredient in a Bloody Mary drink that helps gives it its spiciness. A trademarked hot sauce that consists of red chili peppers, salt and vinegar. The small, very hot pepper originated in Tabasco, Mexico and the hot sauce was developed by the McIlhenny family more than 125 years ago. Its spicy flavor is used in making Bloody Mary cocktails and many spicy dishes. A spicy hot sauce seasoned with cayenne peppers, chili peppers or peppercorns. It is used as a condiment for many foods, such as meats, chicken, and fish, or it can be added to other foods, such as marinades, beverages, dips, chili, casseroles, or other sauces, when a spicy flavor is desired. A condiment that can be made from any one of many different chili peppers, depending on the desired intensity and flavor. 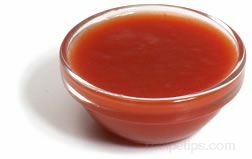 This sauce may be blended with vinegar, herbs, garlic, and other seasonings to produce a somewhat sweet and spicy flavored red, green, yellow, or brown chili sauce. 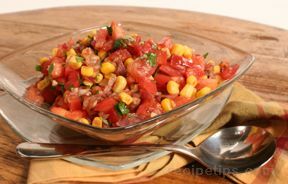 Many different ingredients can be added to create this sauce, such as tomatoes in some recipes, giving the sauce a deeper red color and a stronger tomato flavor, while green ingredients produce the green version of chili sauce. A combination of ingredients, some of which may be roasted will provide a brown-toned sauce. Asian chili sauces are available that contain various herbs such as basil and are flavored with different levels of sweetness as well as heat intensities. 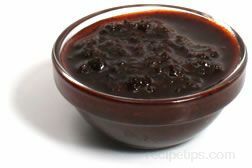 The sauces may be produced as red, green or yellow colored mixtures that are also referred to as chili pastes. 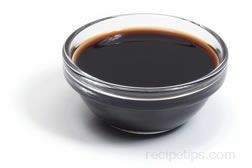 Typically, the Asian sauce or paste will contain more of an oil base (palm or soybean oil) than a U.S. or Mexican variety of chili sauce. Mexican chili sauces are typically red in color, using tomatoes as a base and flavored with various chilies that contain a higher level of heat to provide a very spicy taste. Prepared with varying intensities of heat, from mild to extra hot, all types of chili sauces are commonly served as toppings for red meat, poultry, fish, egg dishes, and other foods to be seasoned with a sauce. A grill sauce is any sauce intended to season meats and vegetables to be grill cooked. Barbecue, teriyaki, mushroom, and garlic sauces are all examples of sauces used for grilling foods. 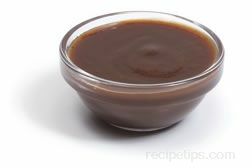 Steak sauce is a condiment, served with steak and other meats, which is a mixture of cooked tomatoes, spices and vinegar. It is generally served cold as a condiment and is also used for basting grilled items. 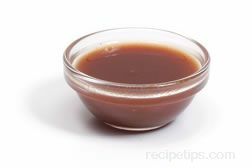 Liquid smoke sauce is a flavoring liquid typically made with vinegar and a wood smoke concentrate, which provides a smoky flavor to foods. The wood smoke concentrate may be hickory, mesquite, or other flavors that enhance the taste of various foods. 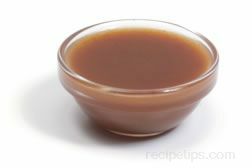 Since the flavoring is very concentrated, it should be added in very small amounts. Use it sparingly when grilling meats. It can also be sprinkled on coals or wood chips to impart a more pronounced flavor to the grilled or smoked food. This product can be found in the barbecue sauce section of most grocery stores. 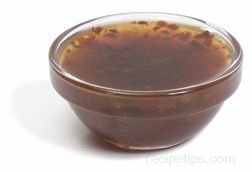 A dipping sauce made for shrimp, crab, and other seafood. 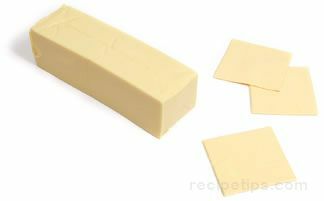 It can also be used for meats, in salads, and with hors d'oeuvres. It is made from a mixture of ketchup or chili sauce, horseradish, lemon juice, vinegar, Tabasco sauce (or other hot pepper sauce) and spices. A flavoring ingredient that can be added to a mixture of seafood, pasta, veal, chicken, and turkey dishes. A traditional Cioppino sauce is added to a variety of seafood ingredients that become part of a Cioppino stew. Originally made by Italian fishermen working in San Francisco, Cioppino stew combines bits of fish, shellfish and vegetables that are cooked together to become a hearty stew. 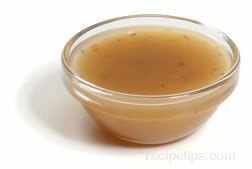 The sauce was then spread over the prepared food or mixed into it as part of the stew to enhance the flavors. Some of the typical ingredients that may be included in a Cioppino Sauce are: tomatoes, onions, green peppers, celery, burgundy wine or wine vinegar, olive oil, lemon juice, garlic, sea salts, cane juice, parsley, basil, oregano, black pepper, and red pepper.